Years ago, a preacher friend of mine named Floyd told me that extremes are dangerous. His words of wisdom have stuck with me. Many of the problems we see in the political, cultural, and religious arenas are tied to extremism. In the church we might see people who are cold and impersonal or we might encounter those who are just the opposite and very emotional. 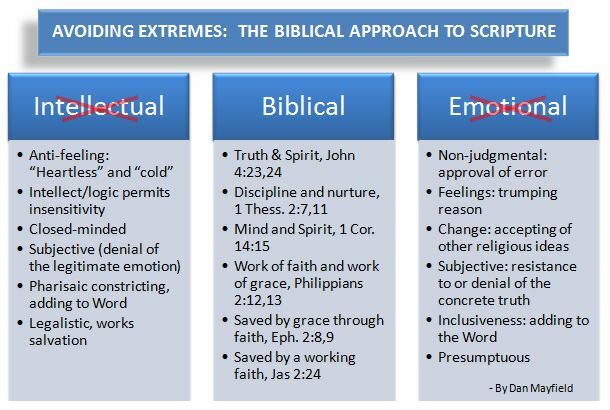 These extremes are inconsistent with the Biblical spirit and character of the New Testament church. When emotions get the best of people, the Word of God suffers. With callous and hard people, focusing on being right can become a hindrance to them showing Christian love and compassion. They forget what Paul said, “Knowledge makes arrogant, but love edifies.” Truth and spirit does not need to be compromised. Heart and mind need not be enemies. They adhere closely to the Word of God. And while not being afraid to confront doctrinal error, they remain patient and loving. When we think of the nature of God, He is a God of love, but He is also a God of justice. 2 Peter says God is going to judge the world at a time in the future, but that message is also balanced with the understanding that He is patient. He doesn’t wish for anyone to perish. Those who miss this point, might settle on an extreme view that God is harsh and mean. Others might reject the idea of His justice and settle on the extreme view that God is going to save everyone. Both extremes are unsupported by the word of God. We need to believe the truth. Avoiding the extremes is possible if we learn from God. Comments? ‹ IS IT SACRED WORSHIP, OR IS IT JUST SENSUAL?